Imagine a world without the Universal Monsters. What would Dracula be without Bela Lugosi? Or the Wolfman without Lon Chaney, Jr.? And let’s not forget where Frankenstein’s monster would be without Boris Karloff. Those classic Universal horror films set the standard for every shocker to follow, and we at NECA know the original movie monsters still reign supreme in everyone’s hearts. NECA is pleased to offer Head Knockers of your favorite silver screen Universal Monsters. Carefully sculpted and vibrantly colored, these ghouls are a welcome addition to any horror hound’s collection. 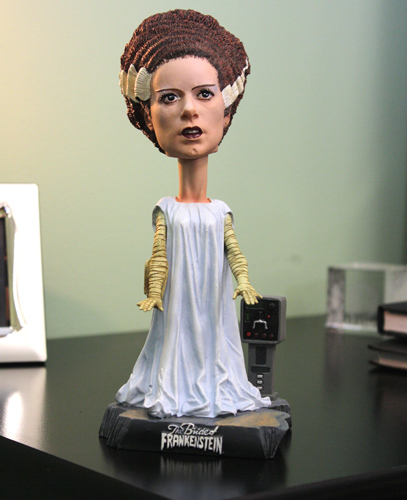 This hand-painted resin Bride of Frankenstein bobble head is a perfect rendition of Elsa Lanchester as she played the role. It stands about 6 inches tall and is waiting to adorn your shelf.